Villa Rica is in the Bay of Calla Jondal, the coolest and most Chic bay on the Island, with its variety of Famous beach Bars and restaurants. Villa Rica is a mansion by the beach in Calla Jondal and offers the services of a Luxury Hotel, within the exclusivity of a private Villa. 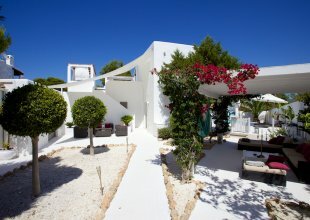 The Villa has 5 double bedrooms with bathrooms en-suite, satellite plasma tv, air-conditioning and mini fridges. On the roof-terrace there is a bespoke hot-tub where one (or 8) can sip a cocktail under the stars, and listen to the waves lapping up against the sands. On the lower ground floor there is an underwater bar and disco, with sub aquatic pool windows... your own private after-hours club. There are various dining areas including a BBQ garden with the palms lit by twinkling fairy lights, a formal dining area for 12 overlooking the heated pool, and a breakfast area with views out to the bay. For your ultimate relaxation, there is a gym, thermal detox sauna, and a steam room as well as an outdoor hottub and two Jacuzzis! A full range of spa treatments are available including numerous massage treatments, Ibiza Salinas salt rubs, Formentera mud treatments, Caviar facials, Cleopatra baths, and for that special night out a 24 carrot gold body glow. 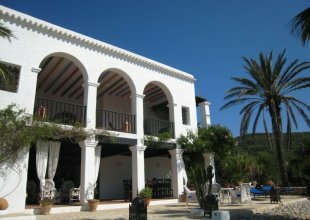 The prices are based on exclusive use of the villa and includes a full team of dedicated staff. With a full team of staff to look after your every need during your stay you are sure to have an effortless and memorable holiday. A full time personal Chauffeur is at your disposal for trips to the beach, restaurants, night clubs, shopping, and airport transfers. The Butlers can arrange all the meals, Special Dinners, and small parties at the Villa. They can also book VIP tables for Night Clubs , Beach Clubs, Restaurants, Yachts, Luxury cars, and take care of your every need, whilst giving you complete privacy.